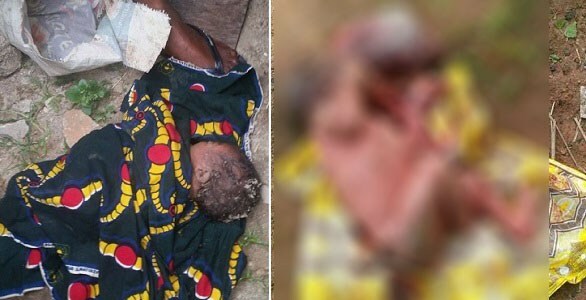 A 38-year-old woman, identified as Kwaseve Fagal, arrested by the Nassarawa police command, has blamed poverty for murdering her newborn baby boy for money ritual in a bid to get out.. According to The Sun, the suspect revealed it was a decision she didn’t blink to take when a native doctor presented her with an alluring offer to make her rich overnight. On August 14, 2017, the housewife who had nursed a full-term pregnancy, was delivered of a baby boy in her home at Gakerko village, Keana Local Government area of Nasarawa State, but the joy of her husband, Paul Fagal, aged 40, evaporated shortly after. Though the couple, peasant farmers, earlier had two children in their 14 years of marriage, the arrival of the new baby lifted the drowning soul of his father who had been toiling over the years, albeit with difficulty, to fend for his family. Unknown to Paul, his wife had been suffocating as they laboured for survival in their years of wedlock and was waiting on the devil for help. Acting on the instruction of a herbalist, she discreetly took the infant to a secluded area of the community shortly after birth and killed him. Then, she took his blood in a clay pot and dumped the remains in a nearby stream. But the bubble burst as the sudden disappearance of the baby aroused apprehension in the community, amid suspicion that the mother from hell might have committed sacrilege. After summoning all the women in the community for interrogation, a threat by the village head, Mathew Oloko, to further conduct orthodox and traditional probe into the incident, unveiled Kwaseve as the perpetrator of the dastardly act. She eventually led a search party to a stream where the decomposed body of the baby was recovered, but kept sealed lips on the motive for the act till she was arrested and taken away by the police. However, in a chanced encounter with our correspondent at the Criminal Investigation Department of the Nasarawa State police command where she is in custody, she told a shocking tale of the circumstances that led her into killing her child to shake off the shackles of poverty. She had been troubled over her husband’s inability to overcome poverty despite the fact that they toiled daily to make ends meet. Rather than reprieve, the situation worsened to a point that putting food on the table became a difficult task. Sometimes, the family stayed for days without food, and despair set in. Faced with gloom, she accepted the devil’s alternative when herbalist in the community she identified as Alhaji Abass Loko, gave her hope. Kwaseve was six months pregnant when he offered her help, which she grabbed pleasantly, even though the price was her unborn baby. “Life became very difficult for my husband and I, to a point that having food daily became a problem, not to talk of catering for the two children we already had. The kids were not feeding well; we go hungry for days because we don’t have money to buy food.